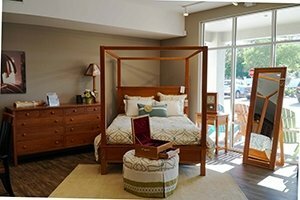 Our DutchCrafters Amish Furniture Sarasota, FL store opens the door to new possibilities in home design. Our showroom displays the latest styles, wood types and finishes in Amish furniture that Sarasota residents and visitors are looking for, and provides the tools and expertise you need to create the solid wood furniture that you envision. We enhance the selections available with some other American made pieces as well. Our personal touch and attention to detail set us apart from the rest. Our goal is to provide beautiful furniture that completes your vision, stands strong throughout the years, and warms your home. We begin with you, what our store can offer and our commitment to creating the furniture of your dreams. What is your favorite room in the house? What do you see in it? Come in and share with us your hopes and dreams for your home. With a store full of colors, textures and styles at your fingertips, we are ready to bring your vision forward. Gleaming with solid wood styles for every area of your home, the DutchCrafters showroom offers an experience like no other. A sampling of heirloom quality furniture is showcased for you to view and touch, use and discover. Explore the contents of your favorite rooms with our stylish bedroom scenes, warm dining room sets, playful poly wood and exciting outdoor furnishings. Create completely customized furniture with dimensions, wood types, finishes, fabrics and additional features that you select. All products on our website and in our showroom are customizable and American made. We offer beauty in design created by skilled hands and your unique vision. DutchCrafters Amish Furniture is committed to each and every customer and provides exceptional customer service that has earned a longstanding A+ rating with the Better Business Bureau. We understand that your furniture is not only an investment, but a reflection of family. Our goal is to create premium quality furniture you can count on with your satisfaction being our top priority. DutchCrafters began in 2003, with Jim Miller and his wife Linse, exploring the backroads of Amish country to find exceptional solid wood furniture. After forming relationships with skilled Amish craftsmen, the Millers brought Amish furniture to the internet, establishing a collection that pays attention to detail and displays a unique and personal touch. 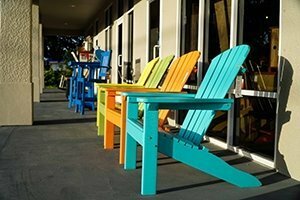 Our Amish furniture store is centrally located, just 1½ miles south of University Parkway and 2 miles north of Fruitville Road on Lockwood Ridge Road in Sarasota. Get directions to the Sarasota showroom. Learn about the delivery of furniture to your home.